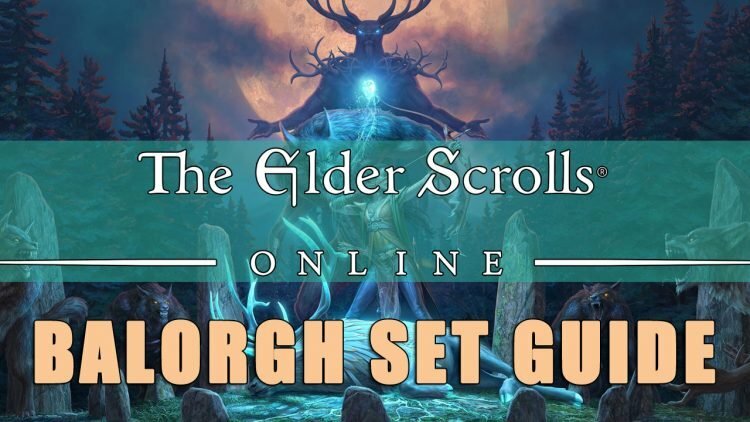 Welcome to another installment of a segment where we dive into one Elder Scrolls Online’s many Sets, and explore what sort of Builds you can make. Not only will we show you how to get the most from these Sets, but we’ll explain where to get them, what requirements there are to obtain them (if any), and everything else you could possibly want to know about them. In this article we will take a look at Balorgh Monster Set which gives a Weapon and Spell Damage bonus equal to the Ultimate consumed. This Set was added to the game with Wolfhunter DLC. It launched on PC/Mac on August 11th 2018 and Consoles on August 28th 2018. Wolf Hunter introduced two new dungeons (March of Sacrifices and Moon Hunter Keep) which are Werewolf-themed. Balorgh Helm drops 100% of the time from the final boss in March of Sacrifices on Veteran mode. Shoulders have a chance to drop from Urgalarg Chief-bane’s Chest using a Pledge Key. This Set comes in all weights with random Traits. The Light version comes with Magicka, Medium with Stamina and Heavy with a Health Enchantment. Keep in mind that you can use Transmutation to change Traits if you wish. The Balorgh Set adds 129 Weapon and Spell Damage for the 1 piece bonus, and the 2 piece bonus gives additional Weapon and Spell Damage for 10 secs that is twice the amount of total Ultimate Points consumed. 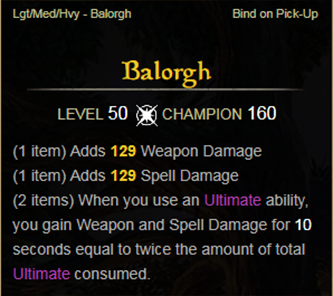 This makes Balorgh great for both Stamina and Magicka DPS Builds. Whenever Ultimate is used you get a powerful buff that lasts 10 secs. 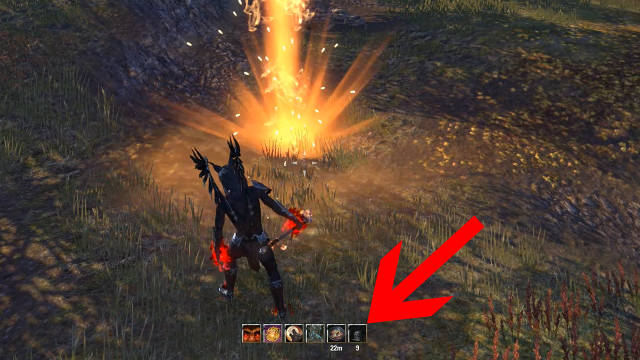 Ultimate Skills are very powerful abilities that do not use Magicka or Stamina. Instead activating Ultimate Skills costs a separate resource called Ultimate Points. Ultimate Points are generated by attacking enemies with light or heavy attacks. When an enemy is hit, you get a buff that lasts 8 secs and it gives 3 ultimate points per sec for a total of 24 Ultimate Points. Ultimate Points are not generated only with attacks, however, but also by Dodging and Blocking. Ultimate is located at far right slot on your ability bar. How this Set works is whenever an Ultimate ability is used all of the Ultimate Points will be consumed, regardless of how much that Ultimate usually costs (which is true anyways, set or not). Those Ultimate Points are then multiplied by 2 and added to Weapon and Spell Damage. So if you are at the maximum of 500 Ultimate Points and an Ultimate ability has been used, 1000 Spell and Weapon Damage is going to be added for 10 secs. This value might seem abstract so let’s compare default tooltip damage with a 1000 Spell Damage increase for some Dragonknight abilities. Now we know that 1000 Spell and Weapon Damage equals roughly a 17.6% increase for the most part, not including Critical Damage, and is a significant increase that lasts for 10 secs. What is amazing is that the Set bonus works with the Ultimate ability you used to gain the Set bonus in the first place, increasing its damage as well. 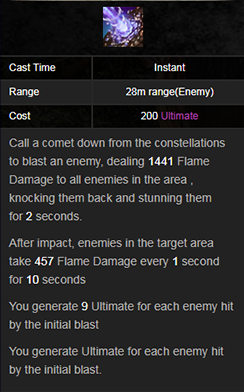 In this case I am going to compare tooltip damage of the Elemental Rage Ultimate with the 1000 Spell and Weapon damage boost. 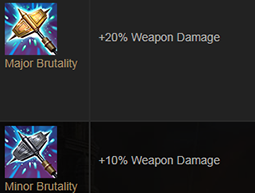 Minor/Major Sorcery and Minor/Major Brutality stack with the Weapon and Spell Damage from Balorgh, and that can lead to even more powerful attacks. 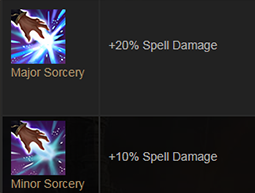 In a perfect world with Minor and Major buffs active, total Weapon/Spell damage gets increased by 30% more, for a total of 1300 Spell or Weapon Damage added when at maximum Ultimate. This allows you to have incredible burst damage, for a very short period of time. The drawback is that you have to not use Ultimate for a lengthy period of time in order to get this burst. The Balorgh Set is a great addition to any DPS build. Having such an increase in damage for 10 secs is beneficial to overall DPS, especially because it increases the damage from initial Ultimate. There are ways to optimize builds around Balorgh in order to get to maximum Ultimate Points faster, but these are not needed to get great performance. Shalk Exoskeleton and Champion of the Hist grant Minor Heroism at all times while in combat, providing 1 Ultimate Point every 1.5 seconds. This stacks with the Ultimate gain from Light and Heavy Attacks. So your Ultimate gain rate with only these two is 3.66 Ultimate Points per sec constantly, assuming that you are hitting an enemy with a Light Attack as part of your rotation, which you should be. I highly recommend one of these two sets with Balorgh, but again, they are not needed for this Set to be used to great effect. Warden‘s have the Shimmering Shield ability that grants Major Heroism for 6 secs whenever a projectile is absorbed. Major and Minor Heroism stack and combined give 4 Ultimate per 1.5 secs. With Ultimate gain from Light and Heavy Attack that can climb to 6.66 Ultimate Points per sec, making Wardens one of the better Classes to use with this Set. There are also other Sets that can be considered “ok” combinations with Balorgh. Hide of the Werewolf grants 5 Ultimate whenever you take damage but it can only occur every 5 secs. Dead Waters Guile is great against tons of trash mobs since it gives 5 Ultimate if an enemy that you damaged dies within 2 seconds. Burst damage is king in PvP so Balorgh is definitely a good choice here, regardless of what sort of Build you play. The added damage increase for 10 secs can make some burst damage abilities even more powerful than they already are. Also, the benefit of having stronger Ultimate than everyone else who isn’t wearing Balorgh could prove to be a big advantage in lots of situations. The main issue is that you need to stockpile your Ultimate as high as you can before unleashing it, which can be difficult if you die. 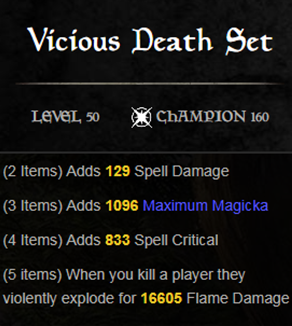 The Vicious Death set can be used to great effect with Balrogh in PvP, because it will increase the damage or your “bombing” Skills like Eye of the Storm or Soul Tether, and of course Magicka Detonation. This will provide more kills, which should in turn provide even more kills. Don’t bomb anywhere without it! 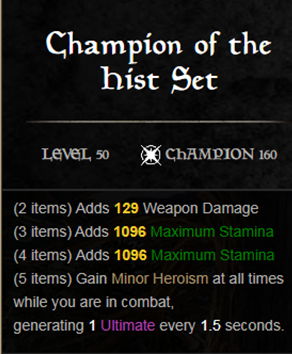 The Last Stand Champion Skill is highly recommended if you plan on going down the fast Ultimate Points route. When you fall below 20% Health you gain Major Heroism which grants 18 Ultimate over 8 seconds. This is probably more useful in PvP than PvE, but it’s not bad to have either way. 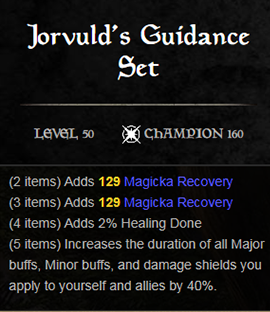 Using Jorvuld’s Guidance can be beneficial if you applied Major Heroism to yourself, such as if you’re a Warden or the previously mentioned Last Stand Champion Skill. It can give you an extra couple of seconds and it all adds up in the end. 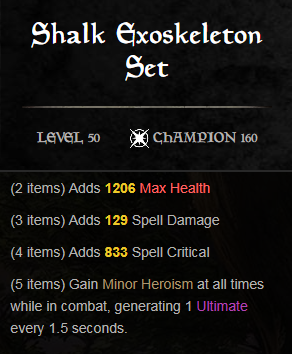 However, if you do not have means to get Major Heroism then it is useless when used with Champion of the Hist and Shalk Exoskeleton, because these effects are permanent anyhow. One of the best Ultimates to have with Balorgh is definitely Shooting Star, because it generates 12 Ultimate Points per enemy hit. Obviously it works much better versus large groups, but even when fighting 2-3 enemies at once it can give 24-36 Ultimate Points instantly which is a great addition. Combine that with Dead Waters Guile and you can gain Ultimate insanely fast when fighting large groups of enemies, or even players in Cyrodiil. You are also much more likely to get kills with it, thanks to the Balorgh Set.